In a better country, this would matter on Election Day. It won't. DeSantis, elected to represent north-central Florida in 2012, appeared at the David Horowitz Freedom Center conferences in Palm Beach, Fla., and Charleston, S.C., in 2013, 2015, 2016 and 2017, said Michael Finch, president of the organization. Horowitz believes that there's a race war against whites in America? How different is this from what most white Americans believe? 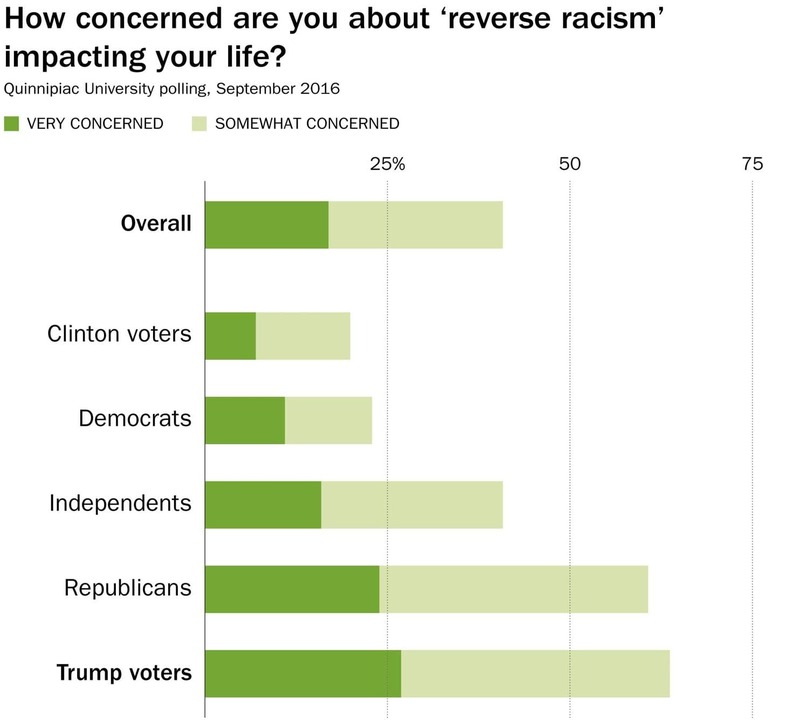 Notable, however, is that while a majority of whites in the poll say discrimination against them exists, a much smaller percentage say that they have actually experienced it. A Public Religion Research Institute poll conducted in May 2017 found that “[m]ore than half (52 percent) of white working-class Americans believe discrimination against whites is as big a problem as discrimination against blacks and other minorities.” Among working-class Americans aged 65 and older, nearly 6 in 10 held that view. 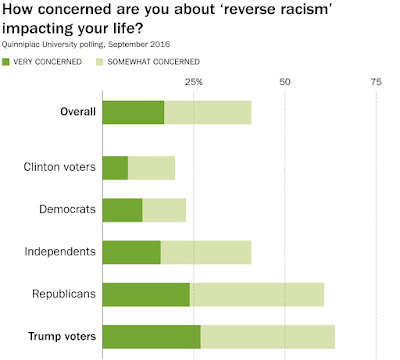 In September 2016, Quinnipiac University [asked] respondents how concerned the were about “so-called ‘reverse racism’, or discrimination against white people” impacting their lives. About 4 in 10 Americans said they were “very” or “somewhat” concerned about that happening — including almost two-thirds of Trump voters. The paper cited is "Whites See Racism as a Zero-Sum Game That They Are Now Losing" by Samuel Sommers and Michael I. Norton (Perspectives on Psychological Science, May 2011). A POLL RELEASED Wednesday by Rasmussen found African-Americans are more likely to be viewed as racist than whites. Thirty-seven percent of poll respondents said "most black Americans" are racist, compared to just 15 percent who said most whites are racist and 18 percent who said most Hispanics are racist. Among conservative Americans, 49% consider most blacks racist, and only 12% see most whites that way. It's inaccurate to call David Horowitz an extremist because his beliefs aren't extreme in America -- they're slightly to the right of what's believed by most white Americans and conservatives (but I repeat myself). That's why, as the DeSantis story notes, "Guest speakers at [Horowitz] conferences over the past five years have included Republican members of Congress, former governors Rick Perry of Texas and Mike Huckabee of Arkansas, [and] young conservative activists James O’Keefe and Ben Shapiro" -- as well as "right-wing European politicians Nigel Farage and Geert Wilders." If you're looking for a bright line between mainstream conservatism -- or even mainstream American whiteness -- and Farage/Wilders-style white nationalism, you'll look in vain, because there isn't one, and it disappeared long before Donald Trump decided to run for office.